In May 2016, I walked away from leading of the largest and fastest growing churches in our country. On the outside I looked like a happy, successful pastor with a wonderful, perfect family. Inside I was exhausted and empty. We knew we had to leave where we were. But we had nowhere or nothing to go to. This was the beginning of a season of transition for us. A season which lasted almost 2 years. 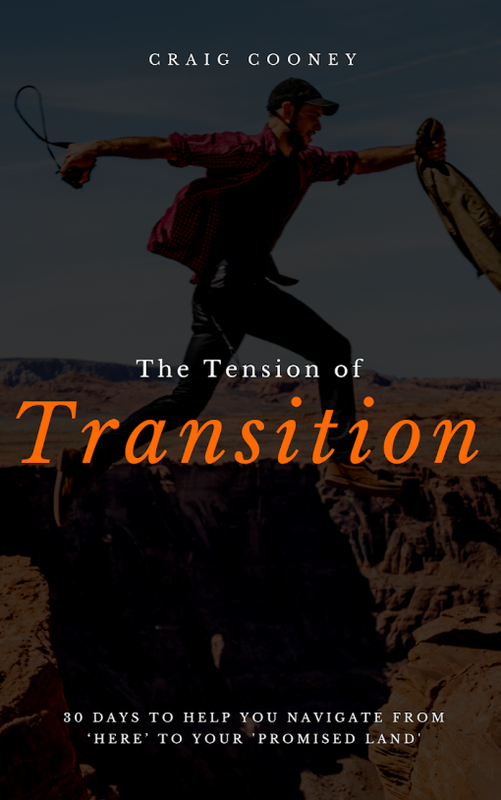 In this book I take you on a journey through our transition, and in 30 chapters explore some of the lessons I learned during this prolonged and often difficult season. ▪️How we know when it’s time to move on and making “necessary endings”. ▪️Letting go of the past so we can make room to fully embrace and experience God’s good future. ▪️The struggle and frustration of those times when you’re waiting on God to move, and Heaven is silent. ▪️How to identify when God is opening and closing doors. ▪️How to recognize God’s favor and lean into it so as to make the most of those areas of your life God is blessing. ▪️How to develop a real relationship with the Holy Spirit and avoid hyper-spiritual stupidity. ▪️Overcoming the inevitable obstacles and opposition that will come your way when you step out in bold faith. ▪️Breaking out of negative relationships and areas where you’ve become ‘stuck’. ▪️Crossing over into the ‘Promised Land’ - the unique inheritance God has for each believer. ▪️How to experience breakthrough and discover your destiny. In 390 pages, split over 30 days, you will go on a journey through the wilderness and desert of transition, growing and learning to trust, so that you can enter all that God has for you. “Your book is so freakishly appropriate for where I am today....I just wanted to encourage you. Your book is, so far, already very good. “I just wanted to encourage you regarding the book you are currently writing. Honestly, we eagerly await every day’s instalment, and every day it feels like you are writing just for us...your words are saving and bringing life. “I give thanks to you that you being obedient to the Lord on writing these pages. I look forward everyday to see the words coming from Father God. It is amazing that I am NOT the only one going through this painful transition facing so many fears. Reading these pages makes feel like I am holding my Father's hand and me as a small kid. “I have no words to say THANKS! I won't get tired to say THANK YOU! “Thank you, this has been such an eye opener to me. Thank you, for allowing God to work through you. Thank you, for taking the talent God has given you to bless those around you. Thank you, for encouraging words that jump off these pages and make such a huge impact. If you have been especially blessed by 'Daily Prophetic' and want to pay more, you'll be able to do that.You can pay using your debit/credit card or Paypal. Once you've entered your details and confirmed your order, you will be added to my mailing list. After payment you'll receive the book in PDF, Mobi/Kindle and EPUB formats.Open it by clicking on 'VIEW PRODUCT' and then 'DOWNLOAD'.